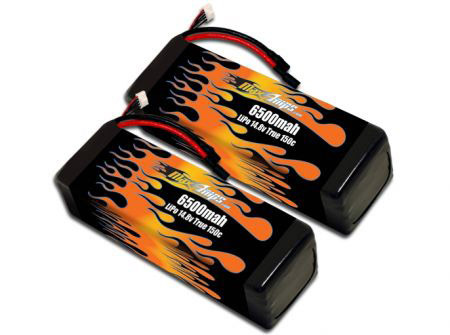 The ultimate battery pack setup for your HPI Baja Flux. This is for 1 pair of our 150C 6500 14.8v LiPo packs, custom wired with high-current 6.5mm Gold female bullet plugs to fit the HPI Baja Flux. Our Race Edition cells are 150C rated for monster amp draw; currently the only cells on the market holding up to 1/5-scale abuse. The most important factor in high-power setups like the HPI Baja Flux are voltage under load, and these cells will maintain higher voltage under load than any other lipo battery pack we've tested. Plus, you'll have no problem getting plenty of runtime with an industry-leading 6500mah of capacity. Great lipos my xmaxx is just incredible with the power this lipos give it. Great customer service that comes with them would get them again and been recommending to all my friends .